Greetings Nihon Goshin Aikido Aficionado! Merry Christmas, and an Aikido New Year! Just a month has passed since Sensei Giorgi’s passing, and I have a couple of more items I’d like to share with you about what I know concerning his philosophy on aikido, and life insights from the people who knew him best. First, he was at least on one occasion a terrific horseback rider. This tale is recounted verbatim from the forward of Sensei Giorgi’s book, and with Mr. MacEwen’s permission. Sensei MacEwen writing: In the early summer of 1984, Sensei Giorgi had been training for a little over half a year but we barely knew each other outside the dojo. I invited him to join me and three other students on a two-week road trip to Colorado. Our travels mixed business and pleasure - we would be camping out in the foothills near Rocky Mountain National park and also doing an Aikido demonstration at the headquarters of a church organization where I had many friends. We also went hiking and mountain climbing and in general enjoyed many of the recreational activities offered by the Rocky Mountains. In one of our correspondences regarding the late Don Angier, Shidare of Yanagi-Ryu, and his potential relationship to Nihon Goshin Aikido, Sensei Giorgi and I were discussing Angier’s “50 Principles.” I was wondering if there was a connection to Nihon Goshin Aikido’s 50 Classical Techniques and the Yanagi-Ryu’s 50 Principles. It turns out there is no distinct correlation, aside from the close association in instructors. 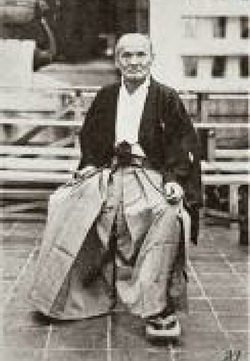 Kenji, Dan’s teacher, was the son of Kotaro Yoshida, the man who taught Master Morita Daitō-ryu Aikijutsu. This discussion prompted an email on March 3, 2015 in which Sensei Giorgi sent me an outline of some Nihon Goshin Aikido principles he had been working on ~ which he speculated would most likely become the subject matter for a future book. Shared in confidence at the time, I’ve been uncertain with how to proceed with the information he sent me, now that it is clear he will not be writing a book on the subject. Still, I feel comfortable sharing one of the aikido formulas ~ for which he seemed to have a knack for developing ~ as it was also in his book, “Integral Aikido” (IA), as well as in the email he sent. Now from here we can go down a myriad of rabbit trails, but I want to focus on Metsuke as it relates to the first component of Sensei Giorgi’s formula. 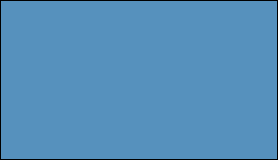 This component is “Attention” ~ so let’s consider our Eyes, and their focus, in a martial situation. We’re taught to center our eye’s attention on uke by focusing on the triangle created between uke’s chin, and his Ai and Ki patches on his uniform. I call this area, “The Magic Triangle”) ~ which I borrowed from a soccer term I frequently used to use to teach players the principles of defending using a zone). Anyway, focusing our eyes on the Magic Triangle allows us to see everything ~ the overall view of the attacker, without focusing on anything specifically. 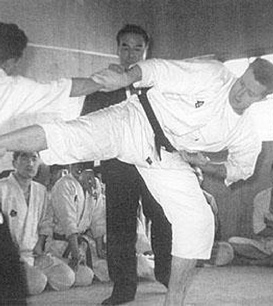 The uke’s punches and kicks are easily spotted by observing movements of uke’s shoulders as he punches or the initial movement of his knees as he kicks. The Magic Triangle also allows us to identify secondary and tertiary attackers in most circumstances. When operating with proper metsuke, eye contact with your attacker is never made, as it only deters you from your overall objective of general awareness, yet everything is seen. In extreme circumstances fomented by Hollywood fight choreographers, metsuke might look like the scene from “The Matrix” when Neo begins to realize his true potential and fight Agent Smith note the action just before he takes a bladed stance with only his left hand blocking (see gif image in the left hand column). The action before he blades his body demonstrates an idea of the attention. Now that is actually a tough question to answer. In fact, it may be easier to point out examples in which metsuke was not established or maintained. 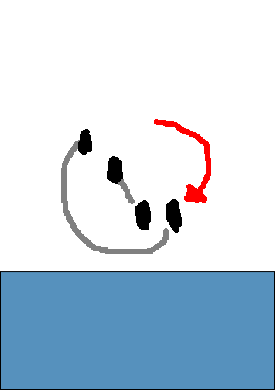 So, here are a few examples of what proper awareness (metsuke) would NOT look like (see the three clips to the left). Remember metsuke allows us to focus on the overall picture; which in aikido is “all” of your surrounding. I’m sure you can see the common thread in the video clips to the left; there is no martial awareness of the surroundings or other potential attackers. My favorite is the clip of the guy who jumps off the hill onto the attacker’s head. Crazy. 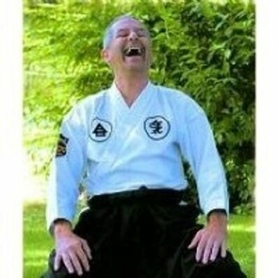 Thanks Sensei Giorgi for all the time you spent developing your thoughts and notions on Nihon Goshin Aikido. We will miss you. I’ve made updates, many updates. For December, I’ve made significant contributions to a wide variety of sections of the website. In the Principles of Movement Section, I wrote an article on the Yang Blend which features a video of Sensei Heath Macaluso. In the article, I analyze Sensei Macaluso’s usage of the signature entry movement that makes our style of aikido recognizable. The title of the article is, “The Secret to Smoothness” Click Here to read it. In the Randori Section I posted an article titled, “Randori: A Nihon Goshin Aikido Randori Training Tutorial” ~ complete with video breakdowns of training methodologies and tactics, as well as excerpts from my old sho-dan test in which I analyze and critique the action of three specific multiple attacker attacks frame by frame. Please check these additions out. I would recommend going to other aikido dojos just to experience the training mat. Why? Well, I’ve done it. Here’s a bit of background. Early on in my Aikido ukemi frustrations, I blamed ALL my bad ukemi on the floor I was training on, so I was always seeking something softer. Anything that might give me a mental edge was sought after. Later, of course, I realized that the training floors didn’t have anything to do with my poor ukemi skills, but my path to becoming a connoisseur of aikido floors and mats was well established nevertheless, and now by natural inclination, I’m always analyzing the training floors of dojos I’ve trained at, and have held an unofficial ranking of them for years. What follows is my take on the top 5 Aikido Floors I’ve ever trained on, and my thoughts about what makes them special. #5 Walt’s House, Columbia SC. The first room in Walt’s house can be perfectly laid wall to wall with temporary mats he picked up at a Surplus sale. As the house has a full walkout basement, the floor in the first room is naturally suspended. Even without the mats, the floor has a natural spring to it that has infinitely more flex and forgiveness than training over mats on a concrete slab. Further, the kitchen is adjacent to the training space, so if you hear dishes rattling in the shelves when you roll, you know your ukemi is not going as well as it should. #4 Carter’s Academy of Self Defense, Lexington, SC. What the floor lacks in forgiveness, it more than makes up for in speed and sheer size. The training space is simply cavernous. It incorporates a single layer system which is comprised of connected rolls of 1.375 inch cross linked, closed cell foam mat laid on top of a wood laminate floor, seated on a concrete slab. The seamless vinyl cover tops everything off to ensure a surface that will protect you, and offer a response as quick as the street. I faithfully attend their bi-annual Friendship seminars, and when I train there, there is no question that my ukemi is better while I’m there. Incidentally, they are moving to a new location in early 2016 that will feature a 1,600 foot training hall. The new dojo will feature the same flooring design that exists at the current location. Want to try it out yourself? 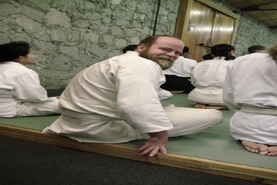 Consider their Grand Opening Seminar in February with Andy Demko, Shihan (Aikikai). #2 The Aikido Center of Atlanta. Built in an old train depot, the Aikido Center of Atlanta is a rock/ stone building which is as much of a conversation piece as it is a training venue. Like the Aikido of Charlotte floor, they have raised the mat off the concrete slab; but with some differences. Aikido Center of Atlanta added a layer of plywood but they reinforce the plywood with 2x4s braced horizontally across each 4x8 sheet of 1/2 inch plywood. The gaps between the 2x4s supports are filled with foam support blocks, and is laid on top of a concrete slab, with Zebra mats on top. This raises the floor about 3.5 - 3.75 inches off the concrete slab. The floor is significantly softer, than any mat over concrete could ever be, while maintaining the same firmness as a single layer system. Like Aikido of Charlotte, they also use the Zebra tatami mats. Taking ukemi on that floor is simply cozy; perhaps every so slightly better than Aikido of Charlotte. I train here when my daughter has a weekend volleyball tournament in Atlanta every spring, and thoroughly enjoy it every time. Want to try it out yourself? Consider their Free, New Year’s Seminar on January 9th 2016. About the canvas mat cover: That canvas mat cover was one thing that I found completely unique to the Bond Street Dojo training floor. It was a seamless, one piece layer of light colored heavy canvas that looked absolutely beautiful in the space. To some degree, I can see why some might think removing the canvas would be a good thing from a stylistic perspective, as the canvas cover is a little unusual and takes some getting used to. Still I actually remember the canvas as a more organic experience than training on a vinyl cover, or mats with exposed seams (so I prefer the canvas). Perhaps one day they can replace it. All that said, if you ever have a chance to train at Bond Street Dojo with Chris Jordan, Sensei do it. The training experience is not quickly forgotten. Even after 3 years, I remember it as a simply amazing ukemi experience. Want to try it out yourself? Consider their weekend semionar with Tres Hofmeister, Sensei (Aikikai), January New Year’s Seminar January 8-10th 2016. Personally, I made a resolution to train there every time I visited the Big Apple, but I have not been able to make a return trip since the last St. Patty's Day Weekend seminar I attended there a few years ago. One other point: Bond Street is trying to raise money to support a move to another location when their lease expires. Please consider helping them out if you have the means to do so. Note that adding additional mats doesn’t seem to work very well. I have trained at a dojo where they just added additional layers of mats to the existing layer of mats in an attempt to soften things up, but it didn’t work. The result was a mat that was way to squishy. Just standing on that floor is something akin to standing in a mud hole ~ where your feet are constantly sinking into the mat. Not fun. Not fun at all. I believe that the key to the best floors is the incorporation of multiple layers of substructure that raise the mats off the concrete slab. These are not springs like you see underneath a gymnastics floor, which create a trampoline effect. These are layers of OSB, plywood, and foam blocks placed on top of the concrete slab, before the mats go down. Generally speaking, the layering effect makes for a fast and firm surface that is very forgiving without being overly bouncy or overly squishy. I believe this type of system puts most dynamic aikido falls and rolls within a comfortable and obtainable range for the typical student. One last point: I have trained on inexpensive fold out mats in a second story building, and found the ukemi experience to be better than at dojos with expensive zebra mats laid out over a bare concrete floor. Assuming you are willing to add the additional sub flooring into the formula, the further removed you are from the concrete the better your floors will be. This is important from a dojo growth perspective also as the better our floors, the better our aikido training experience, and the larger our student body will become. Do you know a dojo that has a great flooring system? Let us know! Are you going to be anywhere near Charlotte, North Carolina the first weekend in February? If so consider attending the Grand Opening of Aikido of Charlotte’s new 1,600 square foot, 72 tatami dojo space in Huntersville, NC. Andy Demko, Shihan, and member of USAF’s technical committee will be the primary instructor for the 2 day event. I will be there! Click here for more information, and to register. More subscribers is the goal ~ so can you help us grow our Newsletter Subscription Base by passing the website along to your training buddies and asking them to subscribe? Our hope is to be an inter-dojo clearing house for all things NGA, but we need more subscribers to do that. Best of all, it’s free, and who doesn’t like the word “free!” Click Here to Subscribe! (And make sure your forward to all your training buddies, and would be training buddies). Do you have an announcement? If so, we would like to share your information on Seminars, Dojo Expansions, Relocations, Grand Openings, Promotions, and/or Other Information with our subscribers. Please forward all of your announcements to us so we can get the word out. Send us the information on your announcement, and we’ll post it here for you. Stay tuned, and let's meet on the mat together soon! Unless otherwise stated, the author’s views, musings, and opinions do not necessarily reflect the attitude of leadership within any of the various Nihon Goshin Aikido associations, or unaffiliated Nihon Goshin Aikido dojos. “Although it is tempting, while facing the attacker in self-defense line, to pre-visualize how one would respond to an attack by using a particular technique, this is "death" if done in a self-defense line and even more deadly if there is more than one attacker. It is cognitive anticipation, which is the antithesis of the open, spontaneously responsive state of mind (mushin) and fluidity of movement that we as aikidoka are cultivating with our training. John Lennon is credited with saying "Life is what happens to you while you're making other plans." In Aikido, "Death (getting hit) is what happens to you while you're making other plans." Bond Street Dojo in NYC. You can see the raised floor in the backdrop. Plants grow in pots between the raised floor and the walls of the dojo. This is the right side of the training floor, with the old canvas mat on top. 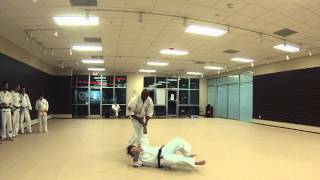 Aikido Center of Atlanta, with its trademark rock walls and wooden sliding door. You can see the raised sub flooring in the foreground. 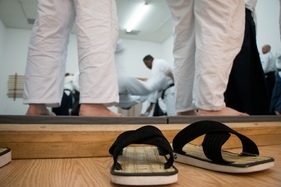 Build Your Own Sub floor for your Aikido Dojo! This 6 minute video gives a step by step breakdown, including costs, and suppliers.